Ken Levine: BioShock Infinite Is "My Game"
Infinite's creative director is taking full responsibility for Columbia's direction. Developing a game as complex as BioShock Infinite is a lengthy process that usually requires input from a variety of creative minds. The creative lead at Infinite studio Irrational Games, Ken Levine, is well aware of the need for this kind of diversity - but when it comes to this game, all of the final calls are his. 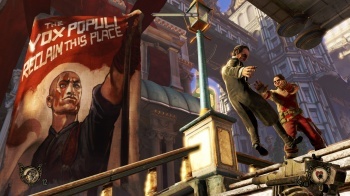 In an interview with Joystiq, Levine framed his role in previous BioShock titles within terms that people outside of games development should find easy to digest. "[It's like being the] editor of a magazine ... but I'm also a writer for the magazine," he said. "I believe more in editorship. Auteur sounds like you do everything." While he accepts that Infinite is by no means the product of just one mind, he does admit that things are a little different this time. "[BioShock Infinite] is my game," he continued. "I love the fact that we sit down and chat with [other developers], but at the end of the day ... this thing's gotta be my decision." Levine has already hinted that aspects of one of Infinite's lead characters, time-space-tearing Elizabeth, are based on his experiences with a girlfriend who suffered through an abusive relationship, suggesting the slightly more personal nature of this title. I'd say that it's brave of him to come out like this and say that final creative responsibility rests with him (or it would be, if the E3 demo/trailers/everything we've heard til now didn't look so gorgeous), but right now, Infinite doesn't look set to do anything other than impress us all way to that blue sky and back.